This summer I’ve been fortunate enough to be a SwimWays Ambassador and they’ve sent me a bunch of cool products to try out including some to help teach my toddler to swim (more to come on that!). In addition to their range of swim training gear they also have a range of fun pool toys and most recently they sent me the Flip Float pool toy! SwimWays Flip Float transforms from a boat to a whale with a quick splash. Take it underwater, and watch the whale spout bubbles. Great for the pool or bathtub! The sides feature numbers and letters so preschoolers can have fun counting and learning their ABCs. No batteries required – all kid-powered play. My toddler has a blast with her Flip Float switching it from a tugboat to a whale. She loves sea creatures as she learns about them on her favorite show, the Octonauts so she’s loving having a whale pool toy. We joke with each other, “It’s a whale, no it’s a boat!”, as we flip it back and forth. You can choose which side you want to play with and it stays in place until you flip it or make it dive down and it will fill with water that will hold it underwater. It’s a big hit with my 3-year-old and she usually uses hers in the bath tub. I really like it as a bath toy because the water does fully drain out of the toy easily by tipping it over, preventing that nasty mold that a lot of bath toys seem to end up getting. 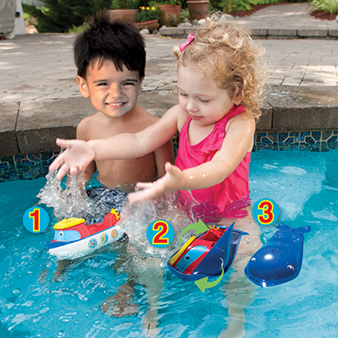 BUY IT: SwimWays swim toys and other swimming products are available at many retailers or online at the SwimWays website. The Flip Boat retails for $14.95. Follow SwimWays on Facebook, Pinterest and Twitter for the latest updates & promotions! I think all children would love these toys! They are colorful and don’t just float around. That’s neat! I bet the young kid version of me would’ve loved these. These look fun. We need more beach toys and bath tub toys. My grandson would love the Flip Boat! We could always use more bath toys, for sure! These look sooooo fun! I just know my daughter would love playing with these in the bath or the pool!